Ten businessmen trying to reach the highest peaks execute a number that requires extreme strength and flawless teamwork. 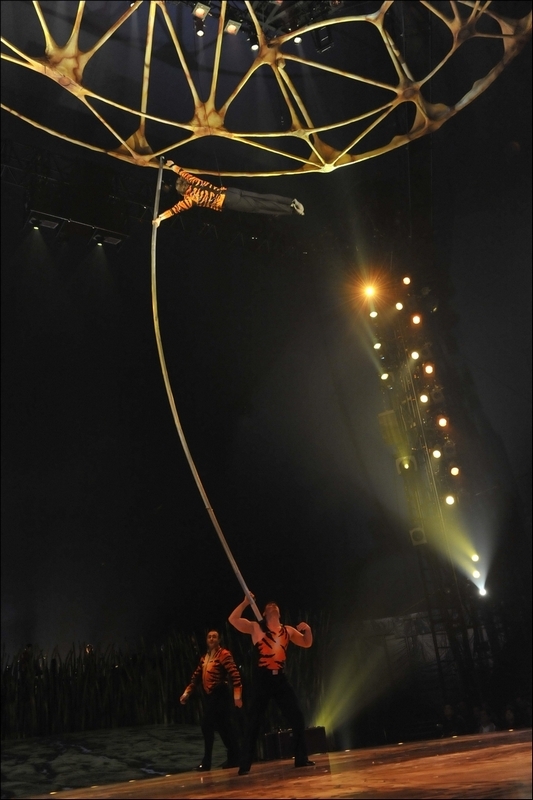 The porters on the ground hold long metal perches while the agile acrobats climb almost to the cupola of the big top. An image of the evolution of man - from primates to Neanderthals to Cro-Magnons - comes to glorious life as a cell phone-addicted businessman joins the circling line of apes in various stages of evolution. He takes the final position in the line, making the point that we may not have progressed all that far. Then - just as that perception has had time to sink in- it's suddenly thrown topsy-turvy. He rips off his suite and moves into another spectacular acrobatic sequence: Perches. Perches includes a series of pliable, metal poles linked together. One man balances these poles on his shoulder, and later on his head, while a couple of men scale up to the very top to spin, tumble and flip about trying fitfully to reach the heavens. The most dazzling variation has one top man holding the second man who is swinging on rings.